Unsure of your religion? A simple solution would be to get a robot to marry you and your loved one. This Japanese couple decided to have I-Fairy, the 4-foot pigtailed marrying contraption made by Kokoro Co., help them cement their vows in Tokyo. Since the lovebirds are involved in the robot industry, they thought that this type of wedding would fitting because robots were what brought them together. You know what this means right? It’s only a matter of time before robots take over our world! Ah! Anyone up for a $100 bowl of ramen? Are you willing to blow over $100 for ramen? I’m not, but apparently some of the customers of Tokyo-based restaurant Fujimaki Gekijo are! The shop calls it the “Emperor Ramen” and the broth has ingredients such as Japanese blue crabs, Thai prawns, beef tendons, ham and various sorts of clams — none of which, in my opinion, really scream over-the-top luxury. I was expecting something along the lines of abalone, shark’s fin or foie gras. Surprisingly, the mundane soup, which is the only thing on the menu, is what you are paying for. This reminds me of a stupid mistake I made a few years ago. I tried an $80 burger in Vegas that, according to a review, was supposed to taste like a “million dollars.” It had foie gras, truffles and kobe beef. But although it sounded good (to me at least) it was way too heavy and turned out to be an awful combination of flavors. A million dollars? It tasted more like a few cents. Sick of getting drenched from wrestling with your doggy during a scrub down? Check out this video of a dog washing machine. You can find these in remote parts of Tokyo. Wow, I need to get one of these! Although my dog Peanut will probably hate me for life if I try to stuff him into one. Utada Hikaru live in Chicago! On Tuesday night, I saw Utada Hikaru, 27, perform live at Chicago’s House of Blues. It was freakin’ awesome! Like any good fob, I’ve been a huge fan of the Japanese artiste since her hit song ‘First Love.’ The New York born singer sang that number and a couple of good oldies like ‘Automatic’ and ‘Sakura Drops.’ I have to say, she sounded amazing live, and her vocals seem to have developed smoother transitions with less vibrato compared to her early days. Love the way she goes breathy at certain parts too. The pic is taken courtesy of my friend Susie. We were high up in the balcony so we couldn’t really get a good glimpse of her face. But we managed to sneak up there and got a pretty sweet view without having to deal with the massive crowds. 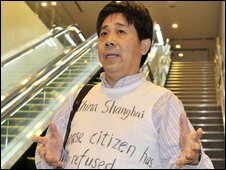 Chinese human rights activist Feng Zhenghu, 55, has been living in the arrival halls of Tokyo Narita International Airport for over a month. Yearning to return home, Feng walks around with a T-shirt that details his situation in English and another fitted over his luggage in Mandarin. He tried four times to enter a Shanghai airport, but was abruptly turned away and sent back to Japan. He’s hoping that his public gesture will cause the Chinese government to consider allowing him to return. Wandering the area between the arrival gates and passport control, which has no restaurants or facilities, Feng depends on food handed to him by passengers coming fresh off the plane. Broadcasting real-time updates of his experience via his Twitter @fzhenghu (English version: @fzhenghu_en) and his blog, Feng has already gained quite a following internationally. 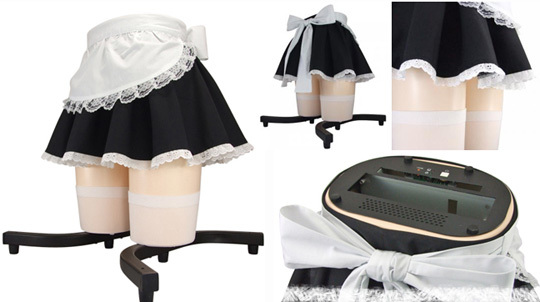 This french maid computer case is a great product for the anime geeks or otakus in Japan. It’s widely known that otakus have a great love for french maids, as seen from the numerous french maid cafes littered in Akihabara or otaku town. This innovative product combines their maid fetish and love for electronics for $550! On November 7, I attended the wedding of Junsuke, my best guy friend, in Tokyo. Boy, are Japanese weddings different from other types of weddings I’ve been to. Suffice to say, it was fabulous seeing him get married to his college sweetheart! I’m happy for him, but when your friends start getting married, it’s a sign that we’re all getting older. – Their company superiors got the best seats in the house while the family sits at the back of the room. It’s all about hierarchy and treating your guests better than yourselves in Japan. – The after party is called the “second party,” and the bride almost always wears white. – There is folk dancing involved in the after party. And in the sweetest and most unique act of the after party, Junsuke re-enacted his proposal scene with his wife. All the best wishes to Junsuke and Rika! It’s all about women taking charge! Two office ladies (or OLs, as the Japanese call them) started a thriving real estate company, Tokyo Girls Fudosan (TKGF), which sets women up in fashionable, yet affordable, female-only apartments. The brains behind the company are Kana Arai, 32, and Kumi Tahara, 27, two former employees who worked in sales at a major real estate agency. Ironically, these partners-in-crime said they had initially viewed each other as competitors. What I love about Arai and Tahara is that they aren’t your average executive women. Tahara was previously a Japan Airlines check-in girl, and Arai claimed that she should’ve received a degree in partying in college. And how did they come up with the plan? It was brainstormed when they ditched work to go have afternoon tea at the Ritz Carlton in Tokyo. Apparently the 400 rooms they rent out are flying off the shelves. Ranging from 52,000 yen (US$584) to 125,000 yen (US$1,403) a month, and with units accommodating four to 10 people, it’s an affordable way to stay in an upscale neighborhood. Tapping into a niche sector enabled TKGF to rise while several real estate companies were going down the gutter. Living with roomies is a very novel idea to the Japanese, who generally stay with their families at home until they get married. To help these women get used to the arrangement, Arai and Tahara have to personally visit three or four units a day to smooth upsets and disputes between the roommates. Apparently the most frequent complaint they hear is “hair stuck in shower drain.” Such a girl thing! British citizen Manjit Singh, 59, broke a world record on Thursday, pulling a double-decker bus 69 feet 6 inches by ribbons tied to his hair. The bus weighed a hefty 8.5 British tons (19,040 lbs). He tried to break the same record earlier using his ears, but failed. Apparently there was an estimated 200,000 people who attempted to break records yesterday to honor the fifth annual Guinness World Records Day on November 12. Speaking of which, my friend Mike actually broke a Guinness world record last year in Japan for traveling longest distance by train in a 24-hour period! The Yakuza, or Japanese mob syndicate, has long been entrenched in the land of the rising sun. A legal entity in Japan, the Yakuza profits from a wide spectrum of sources, including loan sharking, prostitution and surprisingly legit storefronts such as real estate and entertainment businesses. Jake Adelstein, a former reporter who covered stories on the Yakuza for the Yomiuri Shimbun, a newspaper with the largest daily circulation in the world (over 10 million! ), recently spoke to 60 minutes about his famous investigative reporting on Yakuza boss Tadamasa Goto. Goto, who received a liver transplant at UCLA, apparently paid over $1 million for the organ and underwent the transplant despite being on the waiting list for six weeks, jumping about 80 people in line. For more on the Japanese gangsters, buy Adelstein’s book Tokyo Vice or check out his website. It’s a treasure trove for the Yakuza junkie, with some astonishing tidbits. For example, the Yamaguchi-gumi, the largest Yakuza group which holds about 40,000 members, rakes in more than $50 million in private equity every month. The book also noted that the grandfather of former prime minister Koizumi Junichiro was not only a cabinet minister, but also a tattooed member of the Inagawa-kai crime group! So what is Goto a.k.a. the John Gotti of Japan up to now? The scary guy was actually booted from Yamaguchi-gumi because of the unwanted publicity he drew, and is now seeking Buddhist priesthood.